During the Sengoku Period, the rule by the samurai class was sometimes severely challenged by the armies mounted by lower-class self-governing communities called ikki or leagues. The most powerful one was based on a shared adherence to the True Pure Land sect of Buddhism as the ‘Single-minded League or ‘Ikko-ikki’. 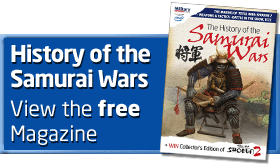 Although often erroneously referred to as warrior monks, the warriors were not ordained priests but samurai of modest means, townspeople, or farmers. They were among the first organised military forces in Japan to embrace the new technology of firearms, and held out against Oda Nobunaga for ten years from their fortified cathedral of Ishiyama Honganji, built where Osaka castle now stands. By comparison with the way he treated the armies of defeated samurai lords, Nobunaga was ruthless in his destruction of these contemptible rabble, and mass slaughter was carried out on several occasions. Curiously, the final surrender of Ishiyama Honganji was a negotiated settlement, and this generosity went some way towards ensuring that no religious armies would ever again rise to challenge samurai dominance. Note that a monk is a lay person who has not taken priestly vows but aheres to a particular faith. Therefore, the classification as monk fits. Adherents to Jodo Shinshu ikki are generally refered to as monto, but could also include sohei. The term jizamurai is applied to those samurai that may have also tended the fields and performed labor – generally of little means – that would have been common in ikki ranks. As ikki fortified monasteries were also fortified settlements – which often lay in the way of valuable trade routes – some ikki could also be said to belong to a wealthier and influencial merchant class and not simply to the peasantry.